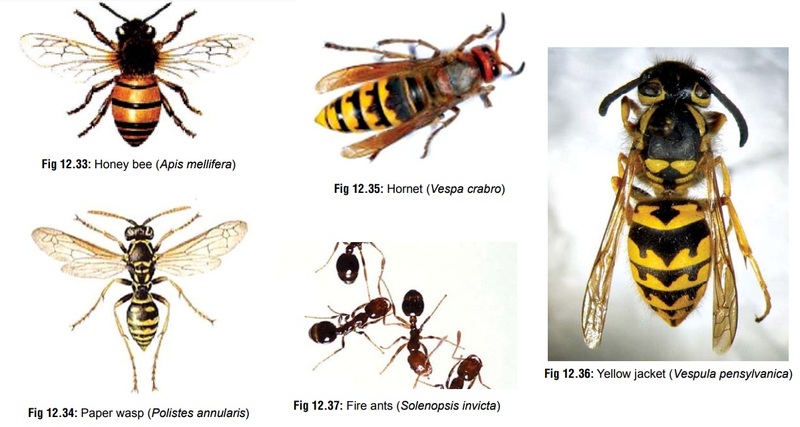 · There are 3 orders of toxicological importance in class insecta: hymenoptera, lepidoptera and coleoptera. This order comprises mainly two-winged flies and ants. The common stinging hymenopterids include bees, wasps, yellow jackets, hornets, and fire ants. The term “hymenoptera” refers to membranous wings that characterise these insects. While snakebites are more common in tropical countries such as India, anaphylactic reaction to hymenoptera stings are much more common in temperate countries. This is despite the gross under-reporting of such stings. Hymenoptera stings are invariably caused by the honeybee* (Apis mellifera) (Fig12.33), paper wasp (Polistes annularis; Ropalidia gregaria)(Fig 12.34), European wasp (Vespula germanica), hornets (Vespa & Dolichovespula species) (Fig 12.35), and yellow jackets (Vespula pensylvanica) (Fig 12.36). A few incidents result from stings of fire ants (Solenopsis invicta) (Fig 12.37), and rarely, jumper ants (Myrmecia pilosula). The body of a bee is generally bright yellow with black triangular markings on the abdomen. It is usually 10 to 15 mm long, and folds its wings back at rest. Queen wasps have similar markings; however, they are larger and can grow up to 20 mm. Bees are attracted to sweet food and meat and can sting multiple times. They are found in large nests, located where shelter is available (e.g. under caves, hollows of trees, and wall cavities). Venom is usually injected through a sting which may be barbed (e.g. bee), or smooth (e.g. wasp). Bees inject approximately 50 mcg of venom which is the total capacity of the venom sac, and leave behind the stings embedded in the skin, while wasps and hornets are capable of repeated stings. Ants generally bite firmly with their jaws and then sting or spray locally irritating venom. Fire ants have well developed abdominal stingers and inflict multiple stings. Hymenoptera venom is a mixture of biogenic amines (histamine, 5-hydroxytryptamine and acetylcholine), enzymes (phospholipase A and hyaluronidase), and toxic peptides (kinins in wasps; apamin, melittin, and mast cell degranulating peptides in bees). A complete list of the components of hymenoptera venom is mentioned in Table 12.6. · In individuals not allergic to the venom, a single sting usually produces only mild effects such as local pain, redness, irritation, itching, and swelling, which resolve in a few hours. These reactions are not IgE-mediated, but represent a response to toxic and inflammatory venom components such as vasoactive amines and peptides. · Local reaction becomes dangerous only if the site of the sting is in a vital location, e.g. mouth or tongue (oedema leading to airway obstruction), or near the eye (cataract formation, glaucoma, etc.). External eye stings can cause pain, swelling, lacrimation, hyperaemia, and conjunctival chemosis. Corneal stings can cause corneal oedema, ulceration, hyperaemia, pain, scarring, and linear keratitis. · Severe cutaneous infection and cellulitis have occurred after stings from yellow jackets and wasps, which may pick up virulent bacteria while foraging on decaying animal and vegetable matter. o About 4% of the human population is hypersensitive to hymenoptera venom. Yellow jackets and other wasps are the most serious offenders and cause twice as many allergic reactions as honeybees. In sensitive individuals, successive stings cause increasingly severe symptoms. Sensitisation to wasp venom is said to occur much more rapidly than to bee venom. It is pertinent to note that there is no association between bee or wasp sting allergy with atopy. o Anaphylaxis is IgE-mediated, wherein the IgE anti- bodies attach to tissue mast cells and basophils in a previously sensitised individual. These cells are then activated, resulting in the progression of the cascade reaction of increased vasoactive substances such as leukotrienes, eosinophil chemotactic factor-A (ECF-A), and histamine. o Clinical features develop within a few minutes of the sting, comprising tingling sensation of scalp, flushing, dizziness, visual disturbances, syncope, abdominal cramps, vomiting, diarrhoea, dry cough, wheezing, and tachycardia. In severe cases, the patient develops urti-caria, angioedema, glottic oedema, profound hypoten-sion, and coma. Hypertension has occurred in children with multiple bee stings, and in adults with multiple wasp stings. Apnoea, respiratory insufficiency and/or cardiopulmonary arrest have been reported in patients who became comatose after receiving multiple stings. Death may occur within minutes. Cardiorespiratory arrest has been reported after multiple stings from honey bees. o Individuals who have had an anaphylactic reaction to a Hymenoptera sting have a 35 to 60% chance of developing anaphylaxis from subsequent stings by an identical insect. Atopy does not necessarily increase the incidence of anaphylactic reactions to Hymenoptera stings, although asthmatic patients have more severe reactions to stings than nonatopic patients. o A few patients develop urticaria, skin rash, pedal oedema, and arthritis between 1 to 5 days after the sting. o Sometimes, a serum sickness–like syndrome occurs a week or more after the sting. This is characterised by malaise, fever, headache, urticaria, lymphadenopathy, and polyarthritis. Renal failure may occur rarely. · Multiple stings (especially involving a swarm of bees, wasps, or hornets) can cause massive envenoming char-acterised by vasodilation, hypotension, oedema, fatigue, vomiting, diarrhoea, headache, seizures, and coma. There have been reports of acute renal failure. · Delayed toxic reactions can occur, characterised by normal initial laboratory results, and subsequent evidence of haemolysis, coagulopathy, thrombocytopenia, rhabdomy-olysis, liver dysfunction, and disseminated intravascular coagulation. · Fire ants can cause severe local reaction (Fig 12.38) and even fatal allergic reaction (especially in young children). · Early effects other than pain, such as vomiting, diarrhoea and hypotension/hypertension. 1. Diagnostic procedures for sting allergy usually involve intradermal tests with various dilutions of Hymenoptera venoms. Most individuals with history of hypersensitivity to Hymenoptera stings have positive venom skin tests. 2. Intradermal skin tests are performed with venoms diluted to concentrations in the range of 0.001 mcg to 1 mcg/ml. A positive test is manifested by a specific wheal and flare reaction. 3. The radioallergoabsorbent test (RAST) is an “in vitro” method that measures the quantity of venom-specific anti-bodies in the patient’s serum, and is used as an adjunct to the venom skin test. It is important to note that patients should not be skin tested until 2 to 4 weeks after a Hymenoptera sting. 4. Hymenoptera-sensitive patients should be referred to an allergist-immunologist trained in venom immunotherapy (VIT). This consists of periodic subcutaneous injections of the appropriate venom, starting with a low dose of about 0.01 mcg, and followed by progressively increased doses until a monthly maintenance dose of 100 mcg (300 mcg for mixed vespid venoms) is achieved. Any patient sustaining multiple stings should be observed for at least 6 hours with laboratory evaluation for haemolysis, thrombo-cytopenia, liver and renal function abnormalities, increased CK, and rhabdomyolysis. Patients with laboratory abnormalities, or signs and symptoms other than local pain should be admitted. · Remove embedded stinger (common in the case of bees) by scraping with a blade or fingernail. Do not grasp the stinger with forceps which will cause further injection of venom due to squeezing. · Local infiltration with adrenaline 1:1000 (0.1–0.3 ml) near the sting site may help impede systemic absorption of venom. · Local cold compress: Local application of an ice pack at the sting site for 15 minutes every 30 minutes may decreaseintensity of swelling, reduce pain, and help retard absorp-tion of venom. · Domestic meat tenderiser (papain) diluted 1 in 5 with tap water, is reputed to produce immediate relief of pain. · Several other local applications have been recommended, including topical application of 20% aluminum sulfate, soluble aspirin, and ammonia and Epsom salt soaks. None of these treatments has been evaluated by formal clinical trials. · Antihistamines: diphenhydramine (50 mg every 6 hours), chlorpheniramine (4 mg every 6 hours), or hydroxyzine (10 to 25 mg every 8 or 12 hours). · Antibiotic may be administered only if there is evidence of infection. · 0.1% adrenaline (0.5 to 1 ml adult; 0.01 ml/kg child) by subcutaneous or intramuscular injection. It may be repeated in 20 minutes. Inhalation of adrenaline by a pressurised inhaler is effective in relieving bronchos-pasm, but not other effects of anaphylaxis. In life threat-ening anaphylaxis, intravenous adrenaline can be given with extreme caution (1 ml of 1:10,000 solution diluted in 10 ml of normal saline, given over 5–10 minutes). It can also be given as an infusion (1 mg in 250 ml of 5 % dextrose, infused at a rate of 1 to 4 mcg/min). The dangers of intravenous adrenaline include ventricular arrhythmias, myocardial infarction, and death. · Antihistamine injection (e.g. chlorpheniramine maleate 10 mg IV or IM, or diphenhydramine 50 mg parenter-ally, then 25 to 50 mg orally every 4 to 6 hours for 24 to 72 hours) is useful in relieving urticarial symptoms. It can be continued for 24 to 48 hours. · Airway management with adequate ventilation and oxygenation: Oxygen—5 to 10 L/min via high flow mask. · Bronchodilators such as salbutamol to relieve dyspnoea and wheezing. – Methylprednisolone—1 to 2 mg/kg IV every 6 to 8 hours. – Prednisone—Adults: 40 to 60 mg/day. Children: 1 to 2 mg/kg/day (divided twice daily). – Large doses of hydrocortisone may be required to help the resolution of massive oedema. · Correction of hypotension and shock: Dopamine and IV fluids. · Since rebound anaphylaxis can occur in some patients (up to 10 hours after a sting), observe every patient for 10 to 12 hours before discharging. · Haemodialysis for renal failure. · Individuals who have recovered from anaphylaxis following an insect sting must be trained to self-admin-ister adrenaline. They should carry a pre-loaded syringe of adrenaline when moving about in hymenoptera-infested areas. · Patients known to be hypersensitive should wear an identifying tag as they may be discovered unconscious after a sting. · Hymenoptera nests in areas around the living or working quarters of a sensitised patient should be destroyed. · When moving outdoors, tight, light-coloured, long-sleeved clothing should be worn. · Clothing with bright floral patterns should be avoided when moving about in gardens, or while working with plants. · Attractive scents, perfumes, soaps, and shampoos must not be used when moving in high-risk areas. · Materials or plants that attract hymenoptera (e.g. cloves, dandelions, open sweet drinks, etc) must be reduced. · Drinking juices or honey directly out of cans and bottles is a common cause of stings in the mouth and pharynx, and therefore should be avoided. · If individuals with venom sensitivity are taking beta-blockers or non-steroidal analgesic drugs, these should be withdrawn whenever possible, as both potentiate anaphylaxis. · Angiotensin-converting enzyme inhibitors and calcium channel antagonists may aggravate cardiovascular response to anaphylaxis, and should be substituted with other drugs if possible. · Adults with a history of significant allergic reactions to hymenoptera stings may benefit from desensitisation (immunotherapy).